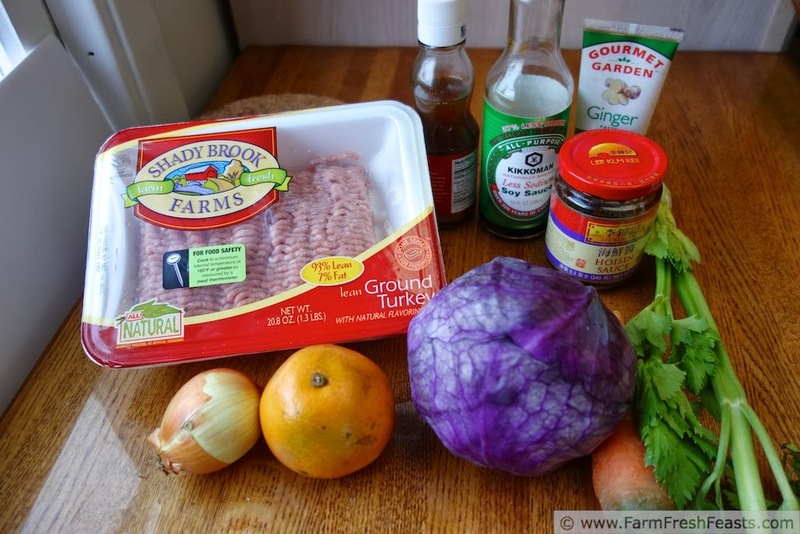 A colorful, flavorful, stir fry of red cabbage, carrot, celery and onion in a fresh orange and teriyaki sauce. Served with orange-ginger-sriracha turkey meatballs and rice. This is another Fast from the Farm Share meal, combining Band Fruit Fundraiser oranges and cool weather vegetables in an Asian-inspired stir fry. 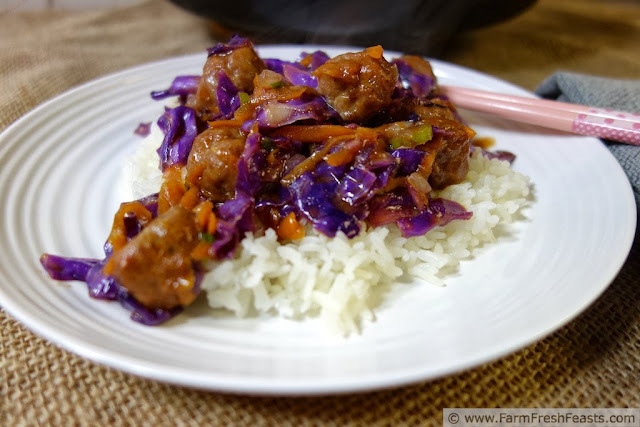 Because I had it, I baked ground turkey meatballs flavored with orange, ginger, and sriracha separately and added them at the end, but this orange-sauced stir fry would be terrific as a side with a different protein source. Working on the savory orange recipes section of my Fall and Winter Fruit Recipe Round Up gave me a hankering for Asian-influenced orange recipes. Since I like to use what I've got, I opened the fridge and chose a red cabbage, a fat carrot, and the last of the celery for this stir fry. It's pretty much slaw ingredients--seasoned differently and stir fried. I used ground turkey for the same reason--and because the idea of having my daughter mix, shape, and bake the meatballs appealed to me after a day of hauling fruit in and out of vehicles. I don't have a juicer--but I have a blender, so I tossed the peeled orange and all of the sauce ingredients into the blender and made quick work of the sauce. Getting the rice going first, and baking the meatballs while working on the stir fry, means that this meal comes together very quickly. If you want a bright and colorful vegetable side, or a flavorful omnivore meal, try this dish. It brightens a dreary day. Missing: sriracha, teriyaki sauce, seasoned rice vinegar, shao, hsing wine, cornstarch, garlic . . . shoot, you may as well just read the ingredient list below because that's the accurate one. I was making this up as I went! If you want to make this as fast as possible--start cooking the rice and preheating the oven to 350 degrees Fahrenheit, then make the (optional) meatballs and toss them in the oven. While the meatballs are baking, prep the stir fry veggies and blend up the sauce. Once the veggies are ready to be cooked, preheat the stir fry pan and make the veggies. If including meatballs, toss them in at the end. I'm listing the recipes in the order I fixed them--but again, meatballs are an optional recipe--the slaw stir fry stands alone. Now I'm singing The Cheese Stands Alone which is kinda sad if you think about it . . .
Preheat oven to 350 degrees Fahrenheit. Place all ingredients in a large bowl and mix well. Have your kid Shape into small 1 ½ teaspoon size meatballs, place on a rimmed baking sheet, and bake at 350 for 15-20 minutes. If adding to the stir fry, keep on reading. Combine all ingredients in a blender. Blend until smooth. Set aside. Heat a large cast iron skillet, wok, or sauté pan over medium high heat. Add the garlic, onions, and celery and move it quickly around the skillet for about 2 minutes. Add in the carrot and cabbage, stir to coat with oil, and continue moving quickly around the hot skillet. After a few minutes, when the veggies are brightly colored and starting to soften, push them to the edges of the skillet leaving an open space in the middle. Pour the sauce into the open space. Once the sauce begins to bubble around the edges, and the milky brown color changes to a clear brown color, fold the vegetables into the sauce. If you are eating the meatballs, add them to the pan at this point. Continue combining until the vegetables (and optional meatballs) are coated and the sauce has thickened, another 2-3 minutes. Serve over hot cooked rice. That purple cabbage is gorgeous in there - so creative! having such colorful veggies from the farm share makes it easy to Eat the Rainbow. Thanks! Oh, my, that looks delish! And I love all the different colors and textures. This would be so good on a cold winter night! I like to make colorful food--and to eat off our colorful plates (I used white so there wouldn't be a conflict here). It was wonderful after hauling cases of fruit on a cold December day. 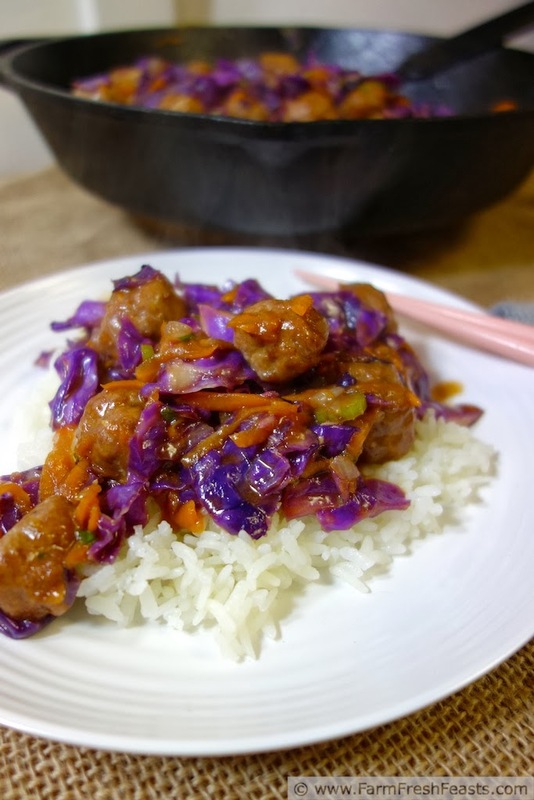 The orange flavor really brightens the dish, and I love the crunch from the cabbage. I think I'd eat anything smothered in that orange teriyaki sauce! Even grilled radicchio? Sorry, that's my most spectacular failure to date, and the family joke. Every time the pediatrician or dietician asks one of my kids what foods they *don't* like to eat, the answer is always Grilled Radicchio. Funny, the medical professionals aren't used to hearing that from kids, and generally don't obsess over their diet after that comment. This bit right here makes me super happy: "a red cabbage, a fat carrot, and the last of the celery." I'm not sure why, but since there's no accounting for taste (my taste that is), it makes me laugh. This is a beautiful dish. I love the colors, and I really like the idea of the sauce here. I need to venture more into cooking other cuisines, and this would be a perfect way to start. So, once again, thank you for broadening my horizons. I'm glad to make you happy! (You read it! Thanks!) I've been super impressed with my farmer's carrots this year. They are gorgeous, fat and sweet and all things that a carrot could be, if it were shaved into a peg shape and stuffed in a bag. Wow! This looks awesome! I like the combination of the ingredients and I also like the different colors of it. I must create this later for my kids I'm sure they will like this a lot. Anyway, thank you for sharing and please keep on updating this blog! I appreciate your kind words--thanks for stopping by!